Select Users → Mass Mail Users from the drop-down menu on the Back-end of your Joomla! installation. 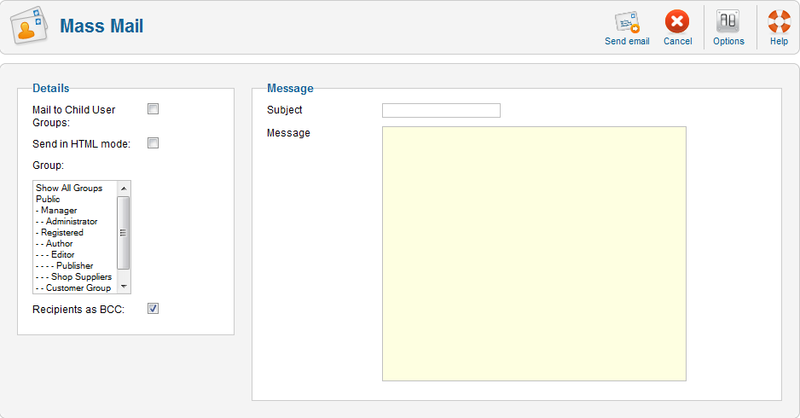 The Mass Mail screen allows Users who are members of the "Super Administrator" group to send an email message to registered users for the site. Users can be selected based on groups. Mail to Child Groups. Whether or not to send the Email to members of all child groups of the selected group. For example, if this box is checked and the "Public" group is selected, the email would be sent to all users, since all groups are child groups of "Public". Send in HTML mode. Whether or not to send the Email with headers that identify it as an HTML document. Email clients that support this will render any HTML codes. Group. Select the groups you want to send the Email to. Recipients as BCC. If checked, all recipients will be included as BCC entries, so none will see any of the other recipients' Email addresses. Because many mail routers treat Email without a To: entry as spam, the site email will be used for the To: entry. Subject Enter the Subject of the Email. Try to make it as descriptive as possible. Any text entered in the Subject Prefix parameter in Options (User Options → Mass Mail) will be placed in front of the subject you enter here. Message. Enter the body of the Email. Any text entered in the Mailbody Suffix parameter in Options (User Options → Mass Mail) will be added to the text you enter here. Cancel. Returns to the previous screen without saving your work. If you press Cancel while adding a new item, this new item will not be created. If you were modifying an existing item, the modifications will not be saved.